Allergena Allergy Drops - made for where you live! Say goodbye to expensive shots, and over-the-counter allergy remedies that leave you feeling like you need to take a nap. Allergy drops have been getting a lot of attention from many reputable medical sources lately, and for good reason - they work! How does Homeopathic Allergena Work? "Immunotherapy" - Uses the body's natural abilities to stimulate or restore a healthy immune system response to fight infection and disease, similar to the way allergy shots work. Allergena contains antigens, minute quantities of the pollen pests that cause your allergies. Regular use of Allergena allergy drops can help your immune system build antibodies against these antigens, providing relief from your allergy symptoms. Natural Allergy relief for where you live! Allergena is made for 9 different geographical zones in the U.S. This means the antigens in a bottle of Allergena for your zone are specific to the trees, weeds, and grasses that are causing you to suffer! 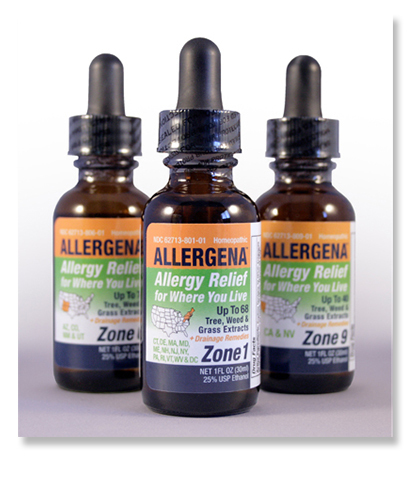 To Purchase or learn more about Allergena for the zone you live in, simply click on your state below! None of the statements on this page have been evaluated by the Food and Drug Administration. This product is not intended to diagnose, treat, cure or prevent any disease.